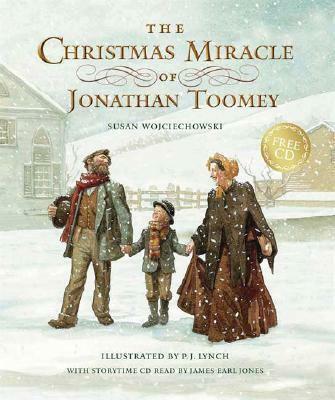 The classic Christmas tale in an elegant new vertical trim size, with completely new notes from the author and the illustrator and a CD narrated by James Earl Jones. Jonathan Toomey is the best woodcarver in the valley, but he is always alone and never smiles. No one knows about the mementos of his lost wife and child that he keeps in an unopened drawer. But one early winter s day, a widow and her young son approach him with a gentle request that leads to a joyful miracle. The moving, lyrical tale, gloriously illustrated by P.J. Lynch, has been widely hailed as a true Christmas classic." Susan Wojciechowski, a former children s librarian, is the author of numerous books for children, including a series of books about Beany, a lovable worrywart. She lives in York, Pennsylvania. P.J. Lynch, one of today s most revered illustrators, has won many awards, including the Kate Greenaway Medal twice for THE CHRISTMAS MIRACLE OF JONATHAN TOOMEYand WHEN JESSIE CAME ACROSS THE SEA. He is also the illustrator of A CHRISTMAS CAROL. He lives in Dublin, Ireland."